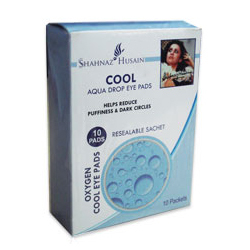 Buy Shahnaz Cool Aqua Drop Eye Pads - Reduce Eye Puffiness, Dark Under Eye Circles, Renewing & Relaxing Treatment. Relieve Stress & Provides Relaxation. Refreshed & Rejuvenated Eyes. Free Worldwide Shipping. Shahnaz Husian - Cool Aqua Drop Eye Pads - Helps Reduce Dark Circles & Puffiness Under Eyes. Oxygen Cool Eye Pads. A renewing and relaxing treatment. Cool Aqua Drop Eye Pads contain plant extracts of Aloe Vera. Green Tea and Chamomile. The pre-moistened pads help to relieve stress and feel relaxed. They also help to revitalize the skin, reducing puffiness and dark circles under eyes. Just apply for 10-15 minutes to feel the refreshing and rejuvenating benefits of natural antioxidants. 1.If eye irritation occurs, rinse throroughly with water and discontinue use.